With just the right level of garlic and a pleasant mix of cheese and almonds, this quick side will brighten any plate. In a large skillet, saute garlic in oil for 1 minute. 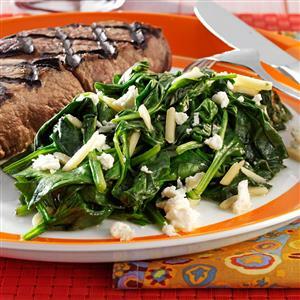 Add spinach and almonds; saute 2 minutes longer or just until spinach is wilted. Sprinkle with cheese. Yield: 2 servings.